Although some critics grouse about them, most investors have long thought that investment management fees can best be described in one word: low. Indeed, fees are seen as so low that they are almost inconsequential when choosing an investment manager. This view, however, is a delusion. Seen for what they really are, fees for active management are high—much higher than even the critics have recognized. When stated as a percentage of assets, average fees do look low—a little over 1% of assets for individuals and a little less than one-half of 1% for institutional investors. But the investors already own those assets, so investment management fees should really be based on what investors are getting in the returns that managers produce. Calculated correctly, as a percentage of returns, fees no longer look low. Do the math. If returns average, say, 8% a year, then those same fees are not 1% or one-half of 1%. They are much higher—typically over 12% for individuals and 6% for institutions. Fees for active management have a long and interesting history. 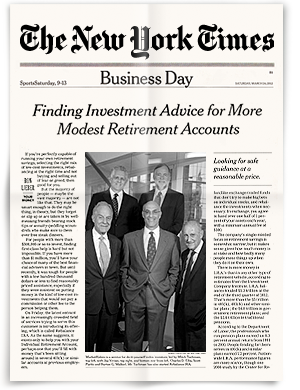 Once upon a time, investment management was considered a “loss leader.” When pension funds first mushroomed as “fringe benefits” during the post–World War II wage-and-price freeze, most major banks agreed to manage pension fund assets as a “customer accommodation” for little or no money—that is, no explicit fee. With fixed-rate brokerage commissions, the banks exchanged commissions for cash balances in agreed proportions. The brokers got “reciprocal” commission business, and the banks got “free” balances they could lend out at prevailing interest rates. In the 1960s, a few institutional brokerage firms, including DLJ, Mitchell Hutchins, and Baker Weeks, had investment management units that charged full fees (usually 1%) but then offset those nominal fees entirely with brokerage commissions. A relatively minor anomaly is getting more attention: While asset-based fees have increased substantially over the past 50 years—more than fourfold for both institutional and individual investors—investment results have not improved for many reasons. Changes in the equity market have been substantial, particularly in aggregate. Over the past 50 years, trading volume has increased 2,000 times—from 2 million shares a day to 4 billion—while derivatives, in value traded, have gone from zero to far more than the “cash” market. Institutional activity on the stock exchanges has gone from under 10% of trading to over 90%. And a wide array of game changers—Bloomberg, CFA charterholders, computer models, globalization, hedge funds, high-frequency trading, the internet, and so on—have become major factors in the market. If the upward trend of fees and the downward trend of prospects for beat-the-market performance wave a warning flag for investors—as they certainly should—objective reality should cause all investors who believe investment management fees are low to reconsider.1 Seen from the right perspective, active management fees are not low—they are high, very high. Extensive, undeniable data show that identifying in advance any one particular investment manager who will—after costs, taxes, and fees—achieve the holy grail of beating the market is highly improbable. Yes, Virginia, some managers will always beat the market, but we have no reliable way of determining in advance which managers will be the lucky ones. Price is surely not everything, but just as surely, when analyzed as incremental fees for incremental returns, investment management fees are not “almost nothing.” No wonder increasing numbers of individual and institutional investors are turning to exchange-traded funds and index funds—and those experienced with either or both are steadily increasing their use of them.